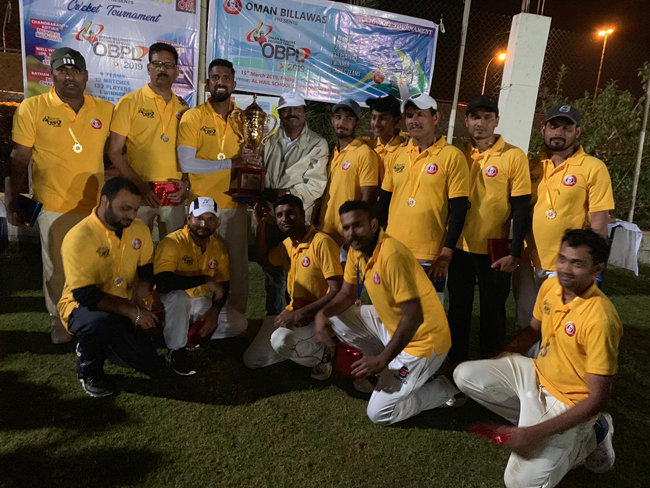 Muscat: Oman Billawas, an association of Billawa community members residing in the Sultanate of Oman, organized its first ever Oman Billawas Premier League (OBPL 2019) cricket tournament on Friday, March 15th on the lush green lawns of Al Hail School of Cricket at Mabella in Oman. The event marking the 10th year of unity and progression of Oman Billawas is a refinement of its annual cricket day. This innovative concept of cricketing was showcased for the first time within the community matches. The day began with amazing weather, along with an extremely well organized set-up, good pitch and a well sequenced plan for the day ahead. There were 9 teams, 13 matches, 133 players and 2 ladies teams who participated in this league. Oman Billawas President Suchethana Anchan, Vice President Suhan H and committee members were the back bone to the success of the event. The planning was mapped on the lines of the league matches, whereby there were nine sponsors, who selected their team through the process of lucky pick of lots. This brought about having well balanced teams, divided equally with the best batsmen, bowlers, keepers and all-rounders. The ladies teams had T-shirt sponsors as well. Each team was branded and had a unique team name with color coded t-shirts. The concept of the game was scheduled as group A, B, C and the top 4 teams’ qualified for the semifinals after the league rounds. The teams were (1) Mumbai Billawas captained by Manohar Salian and sponsored by Chandrakant Kotian; (2) Meunukuna Bollilu captained by Sathish Barkur and sponsored by Kiran Anchan; (3) Biruva Strikers captained by Rohidas Manjeshwar and sponsored by Krishnaprasad, Vittal Poojary and Harish Suvarna; (4) Koti Chennaya X1 captained by Somanath Poojary and sponsored by Mahesh Salian; (5) Biruver Challengers captained by Ratheesh Salian and sponsored by Rathan Kumar; (6) Biruva Javaners captained by Prakash Bellore and sponsored by Rajaneesh Sanil; (7) Geleyara Balaga captained by Nikhil Kumar and sponsored by Guruprasad Amin; (8) Mangalore Tigers captained by Shailesh Poojary and sponsored by Dinesh Poojary and (9) Namma Biruver captained by Sukumar Anchan and sponsored by Jayaprakash Poojary. The Ladies’ Teams were (1) Bolli Bolpu captained by Akshatha Rishikesh Amin and sponsored by Rishikesh Amin and (2) Rani Abbakka captained by Anusha Arun and sponsored by a well wisher. Over 250 people witnessed the tournament and enjoyed it to the fullest. The team owners mingled with the players and this brought about a lot of unity with the groups. The play ground was sponsored by S. K. Poojary, Managing Director of Red Rose Furnishing Company LLC. The committee had made elaborate arrangements for the spectators and guests to make this a great experience for them. Taking precaution against the weather they had also installed tents on the ground with proper seating arrangements. The logistics team arranged for breakfast, tea and lunch with traditional dishes like Rice, Rasam, Kadle Suran, Chicken Sukka and to top it off there was Boondi Ladoo too. The matches were tough and each team played two matches against each other. Biruva Javaners were declared the winners of the tournament under the captaincy of Prakash Bellore and the Runner-Up were Menukuna Bollilu, captained by Sathish Barkur. Finally there was a lucky dip draw and concluding the event showcased the motto ‘Team Work to make the Dream Work’. Manohar Salian, Gangadhar Poojary, Sujith Anchan, Madhuri Rathan Kumar, Chethana Kotian, Preetham Kotian, Vishwanath Bangera, Nita Salian, Pradeep Palan, Hitesh Kumar, Vijay Poojary, Vittal Poojary, Purushottam, Arun Bangera, Harish Sanil and Dr. Shodan Kumar supported the event with various sponsorships.